Situated in the heart of Llangeitho, our hall is easily reached by car, public transport and on foot. 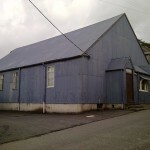 Llangeitho Jubilee Hall is a large hall suitable for all celebrations, functions and meetings plus drama productions as there is a stage with a sound system. The large Main Hall and Kitchen are on the ground floor, and the Conference Room is below the stage (which has separate access). There is enough tables and chairs for around 250 people, and we have dedicated parking spaces and disabled access to upstairs and downstairs. The hall is a hive of activity, welcoming the young & old, through the doors each week. The centre is also popular for children’s parties after school or on Saturdays. So whether you’re thinking of booking a party or starting a new group; Llangeitho Jubilee Hall will have something to offer you. We have a small kitchen adjacent to the main hall, where you can prepare beverages and light refreshments. •	Meetings held in the main hall @ £10.00 (2hrs) •	Meetings held in the downstairs conference room @ £6.00 (2hrs) •	Fundraising events @ £20.00 (3hrs) •	Parties in the main hall @ £10.00 (2hrs) •	Use of the Kitchen will be an additional charge of £5.00 to the above charges Note: If the hall is booked on a regular basis we can offer a discounted fee.